Hebrews 10:36 “For you have need of endurance, so that after you have done the will of God, you may receive the promise:” In Hebrews the bible tells us that we have need of endurance and after we have done the will of God we may receive the promise. I believe the Lord is trying to tell us that life isn’t always easy but if we stay the course and follow Him we will overcome victorious and receive everything He has intended for us. God is the Alpha and Omega, (the beginning and the end) He is Lord of Lord, King of Kings, Ruler of the universe and He cannot lie. The bible goes on to say in 2 Corinthians 1:20 “For all the promises of God in Him are Yes, and in Him Amen, to the glory of God through us.” That is some great news friends! Strength, tolerance and perseverance are some words that come to mind when you think of Endurance. Dictionary.com says the fact or power of enduring or bearing pain, hardships. The ability or strength to continue or last, especially despite fatigue, stress, or other adverse conditions; stamina: He has amazing physical endurance. Okay so in the dictionary it says, endurance is to “continue on” when bearing pain or hardships, the “ability or strength” to “keep going”, especially despite fatigue stress or other adverse conditions. It’s the ability or strength to keep going! We don’t stop in the middle of a hardship we must to keep going, continue on while moving forward. This scripture has made a big impact on me. I believe it’s telling us that even when we are so tired we cannot hardly stand it, or when we are stressed out to the point we think we cannot make it anymore, or if we have any other adverse condition such as a health condition, if you received a report from the doctor that wasn’t what you wanted to hear, or if you have been living with a chronic disease, or ailment that has gone on far too long. There is good news here for each and every one of us to grasp and take hold of and that is even in any of these scenarios the Lord tells us He is with us through our endurance and when we have done the will of God we will receive His promises. If the bible tells us we should lighten our loads. We must lighten our loads! How do we lighten our loads you ask? Well, it says here, by dropping every extra weight, every sin that clings, let’s take a look at the word clings for a moment, it means to grip, stick like glue, hang onto to us and then it says and slackens meaning slows down our pace. This is saying get rid of every sin that tries to grip, stick to you like glue and hang on and it goes on to say that it slows you down. Seems to me Jesus is trying to tell us that we have a long race ahead of us and sin gets in the way, it slows us down, it doesn’t offer us anything good although it may have a tempting package on the label, that is about the only thing good about it. Satan may be good at marketing, but we are not buying what he is selling! Throughout my healing journey I have been on this last year and a half I have been faced with many stormy seas. I have trusted that the Lord, Jesus Christ as He has walked beside me wherever I have walked and I’m sure at times He has had to carry me. I am thankful. Knowing He is watching over me, so no matter what report the doctors give me, or no matter if the insurance company denies my medicine until fall, or if I feel so tired I can barely get out of bed, or if I feel like a marathon race runner feels on their last leg of their race at the start of my day. I know that God is for me! I’m not sure what you are facing right now, but I do know God is for you too! Wow, this is a very powerful scripture! The bible is telling us that we will be faced with stormy seas. However, He will be there in the midst with endurance and calm. Jesus will be with us wherever we go. We are given a promise here and that if it seems like we are walking through fire with flames we are to always remember that He is there and He will keep up from burning. We read earlier that All the promises of God are yes and amen. This is encouraging new to me and I hope this promise encourages you as well. This journey has not been an easy one for me however I can tell you that I have developed endurance. I can tell you that the joy of the Lord is my strength! It is through praise and thanksgiving I feel such a peace and know that my Jesus is working on my behalf. For years I had been anxious and fearful from many hardships and abuse from the past. I can tell you my doctor prescribed me medications to help ease the anxiety, fear and pain. There was a problem with this plan and at the time I didn’t know there could possibly be a potential problem with a doctor trying to help me. Isn’t it funny hindsight is always 20/20. The problem was that I was trading one set of problems for another set of problems. Most people think a pill prescribed by your doctor can cure anything, NOT True; in fact all it did was just put a Band-Aid on the problem and made me become dependent on the medication. So I just traded one thing for another. I became a slave to the medication. I had to take it because I became addicted to it. It’s interesting because of fear I took this drug became addicted to it and when I couldn’t get off of it, then I was fearful again. I guess you could say the enemy gripped, glued and was hanging on to me. There is good news though. Throughout this journey I’ve been on I feel like the Lord is cleaning me up physically/spiritually totally and completely healing me from the inside/out! The Lord has healed me from the addiction from the medicine after 20 years! That is incredible to me! I have not had alcohol in a year and a half either. I didn’t have a problem with this but I feel like the Lord is just cleaning house and this is just one more thing that needed cleaning. Pastor Robert has talked about alcohol and spirits…if there is a chance of a correlation between the two I am better off not having that either. A vision, it was Jesus stripes, underneath His stripes was a sand hour glass with blood flowing freely. It was a pretty incredible sight to see really. Lord what are you trying to tell me with this vision. I pondered, I understood that His stripes means healing, and His blood flowing was cleansing, healing and deliverance power that was flowing freely! Another vision I recently had was a serpent looking periscope. It was a cross between the two. I truly believe the Lord is showing me there is an enemy out there spying on us, looking, analyzing, everything we do on a regular basis, studying us, so when an opportunity arises…bam! No need to be afraid as the bible tells us in 2 Timothy 1:7 “For God has not given us a spirit of fear, but of power and of love and of a sound mind.” This is not just good, but great news! Spiritual forces of darkness and wickedness exists in the world my friends. It’s not just some make believe Disney movie characters, they are real! Satan fell from Heaven and took a 1/3 of the angels with him. We must learn and understand what we are dealing with not to fear but to take action to overcome. In Matthew 10:16 it says, “[ Persecutions Are Coming ] “Behold, I send you out as sheep in the midst of wolves. Therefore be wise as serpents and harmless as doves. There you have it, right there in the bible, telling us that persecutions’ are coming, they come my friends. The question is what are you going to do when they come? Are you going to bury your head in the sand? Or are you going to take practical advice from the bible? I believe I will take advice from the bible. So you might ask what does it mean to be as wise as a serpent and gentle as a dove? Well, let’s look at that for a moment. Serpents for example are wise, cunning and are ready to strike its target at a moment’s notice. Remember earlier when I told you that that the enemy is always studying you. This is so right at the opportune time they can strike at a moment’s notice to do the most damage to you, your family, or your belongings. You might say how can I combat that? Well, I believe scripture can help us combat the enemy. We looked at the serpent now let’s take a look at the doves. Doves are symbols for love, when you think of doves you might think of love birds and they are very gentle creatures. Loving, sweet, gentle creatures that God created for us as an example for us to overcome the enemy. Love is so powerful that we are told to abide in love. Abide, which means to accept, to stand for, to tolerate, to support, to persevere, and to live! I have to believe that love must be extremely important to our God if He is giving us a new commandment and it is to love one another as he has loved us He wants us to love others in just that way. This brings me to share the most selfless act ever made by Jesus shedding His precious blood for you and me. Jesus suffered terribly so you and I could be in right standing with the Father. So we could live and not die and declare the works of the Lord! Jesus alone defeated the enemy and overcame victoriously! Jesus, a selfless act of love! As Jesus sacrificed His life, shed His blood (it now flows freely) for you and I to walk in, freedom from our transgressions, freedom to be in perfect shalom peace, freedom to be healed and the freedom to choose life and live it abundantly! Thank you Jesus for your loving acts of sacrifice! Love is a gift! Receive it, care for it and pass it on to others. I belong to Gateway Church, and one of the aspects I am most thankful for is the worship our church uses to bless the nations. I can hear our pastors like Kari Jobe singing with humility, wisdom and understanding. When I listen to songs like O the blood (Gateway Worship 2010), I am reminded that Jesus gave His life and every drop of His blood for the lives those living today. O the Blood inspires me to remain steadfast for healing because Jesus paid the ultimate price, giving His life so that I could live. He sacrificed, so I would be made whole even as the enemy continues to attack my health! Jesus died on the cross for us to live in victory! You and I were gifted a new name as He took his dying breath – that name is Overcomer. Don’t be tempted to pick up destructive thought patterns such as “I’ve done things too bad for anyone to forgive me,” as Jesus paid the ultimate price already knowing the sin you would commit! ALL means ALL. It doesn’t mean sometimes when it feels good, nor does it mean, “when you have finally decided to forgive yourself.” Jesus says ALL and guess what? It’s His Blood, so He gets to decide, and He decided to forgive it ALL! Be encouraged to stop beating yourself up for past mistakes and failures. Instead, realize Jesus desires to bath you in His blood and wash you clean as snow. Jeremiah 29:11 For I know the plans that I have for you, declares the Lord, Plans to prosper you and not to harm you, plans to give you a future and a hope. So even though we may not always make the right decision in everything we do remember we are forgiven by the precious blood of Jesus! O the blood – Gateway Worship 2010 (lyrics) (Best Worship Song). I had a dream the other night that I was with a bunch of people and we started to be attacked by terrorists’ (the enemy). Many of us were shot up and bleeding badly, some didn’t make it, and many survived. One terrorist came at me with a machine gun and shot at me seven times, six times in the chest area, and once in the stomach-liver area. I was bleeding badly and I remember there was blood all over my body. The terrorist were lurking all around so at this point all I could do was to be still, In Exodus 14:14 The Lord will fight for you, you have only to be still. As I lay still, I didn’t know if the enemy thought I was dead or not, I guess at that point it didn’t matter they were leaving me alone. I remember someone coming into the area in which I was at and he quickly saw the puddle of blood around me and all over my body, then looked back and saw the terrorist coming back into the room we were in, he got down on the floor and put his body against mine to get all bloody. Not in any sexual way at all, it was only to get the blood on him so the terrorist wouldn’t bother him either. Because once the blood was on me I seemed to be invisible to the terrorist. Was I protected by the blood of Jesus? I think so! After the terrorist fled the area we got up to see if we could get some help only we ended up helping others as we journeyed though this venue. Everywhere we went people wanted this blood I had dripping from my body. Could it be, the people seeing blood as a protection from the terrorist? I came to realize it was Jesus blood they wanted. It was Jesus’ perfect blood that they so desperately wanted to protect themselves from the terrorist. Everywhere we went it was the same attitude. I believe people are desperate for Jesus and His precious Blood! As we went through this place room by room sharing the Blood of Jesus with everyone, as this was the goal. Everyone was feeling loved and protected, with the precious Blood of the Lamb and the words of our testimony. In the dream I was shot seven times which is the exact number of instances Jesus bled. This was a confirmation that His Blood was covering me. It’s also encouragement for me to use the authority Jesus gifted to me to manifest my healing to fulfill my God-given destiny! We all have a mission to accomplish on Earth – to share the love of Jesus Christ to the nations. When I finally allowed myself to wrap my mind around how much Jesus loves me and how it was my job to share His love with others, it radically changed my life. bride that day, and she is forever yours! Mark 8:25 NKJV – Then He put His hands on his eyes again and made him look up. And he was restored and saw everything clearly. I just want to tell the world how completely in love I am with the Lord! How in awe of Him I am every day even more than the day before. I haven’t written in a little while as I have doing what I have been instructed to do by the doctors. This has been a time of getting stronger, resting and getting ready for the treatment in January. I don’t want to hinder God, so if He wants my healing to manifest when I go back to the specialist and not need treatment that is okay with me. I am open to healing being a process or a miraculous healing instantaneous! We had a miracle service at our church November 17th and when the church prayed, my friend and sister in Christ had a vision from the Lord of an infestation in my body. Then she heard the Lord say clearly, she (meaning me) has been exterminated. That the infestation that once was in her (meaning my) body has been exterminated. Praise the Lord! Thank you Jesus! I believe I am healed. The plan with the specialist is to go back to their office in December to talk about the treatment plan in January. I am believing I won’t have to have the treatment as I am healed! But again, I am open, if the Lord wants me to walk this out in treatment I will do it. I want to be obedient to the Lord! That is first and foremost in my heart. I think about the story of the man that was treading water in the middle of the ocean trusting God to save him. The Lord sent the Coast Guard to rescue him. The man said no, I am waiting for the Lord to rescue me. Then the Lord sent him a helicopter and the man continued to say no, I am waiting for the Lord. Then the Lord sent a huge yacht to rescue him and the man said no, I am waiting for the Lord to rescue me. The man went to be with the Lord as he couldn’t tread the water any longer. When the man got to heaven, he asked the Lord, I thought you were going to rescue me, what happened? The Lord answered, I sent you two boats and a helicopter and you refused to receive My help. I am not going to refuse anything or anyone that the Lord sends to help me on this healing journey. I know, that I know, that I know, that God is a God who heals. He healed back in His day and He still heals today! The Lord has a plan for my life and I am going to live out my destiny that He created just for me. To accomplish this I must be willing to step out of the boat and on to the water just as Peter did. Peter stepped out of the boat onto the water, He trusted the Lord. Our natural tendencies are to be like Peter’s and get distracted. It is imperative to me that I remain focused on the Lord and not look away to distractions. The Lord will order and direct my every step as I trust and lean completely on Him. The Lord has blessed me with a gift of writing prophetically. What an incredible honor to be able to write with the Holy Spirit pouring out of me. The Lord has been dealing with me to share words of encouragement with women around the world. I had to humbly and boldly step out to share these beautiful words with women as directed by the Holy Spirit. I have done just this and unexpectedly the Lord once again shows Himself so mightily! The Lord highlighted a woman on the phone and told me to share a word that he downloaded to me the day before. Obediently, I began to share this blessing, then this sweet woman shares with me that this is a gift I have and confirms to me that I should be writing small books, devotions if you will. This is something that my sister and friend has shared with me previously. Wow! Then I find out this precious woman is a doctor and her specialty is what I am going through right now! She also shared with me that she is collaborating on a book and her part is the exact specific thing I am believing healing for. My mouth dropped, again I started praising and thanking the Lord! Let’s recap, through a phone call, the Lord instructs me to share a blessing with a woman. Then this woman, it turns out that she is a doctor, not only a doctor, her specialty is my exact diagnosis. She understands exactly what I am going through. Not only does she understand, she encourages me, blesses me as well, not only encourages me to write the small devotionals that I am supposed to write. But she encourages me in the midst of the disease that has been diagnosed to me. How incredible is that? Simply amazing in my book! On August 23rd and 24th the Lord inspired me to go to our healing training at Gateway Church. I know that I have been called by God to this ministry and have several prophetic words confirming this call. On Friday evening I met a young girl in class her name is Hannah what an incredibly sweet obedient faithful daughter. Hannah shared with me that the Lord has given her a prophetic gift of drawing. She has felt the Lord lead her to serve in the Healing rooms to encourage others. At the end of class Hannah shared that she had something for me. With great expectancy I accepted a picture from Hannah. I could hardly believe what I was seeing before my very eyes. This was the exact picture of what the Lord showed me in the vision He gave me during the June Habitation service. I encouraged Hannah and shared my testimony with her. I let her know that she is hearing from the Lord and obediently serving! Before this class I did not know Hannah, nor she me. The Lord continues to show me how beauty comes from obedience to Him! 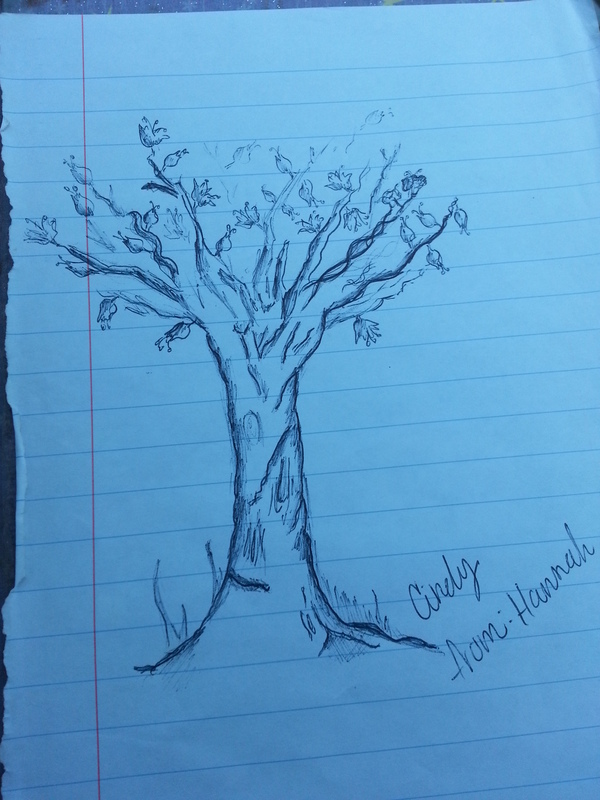 Below is a picture of the tree Hannah so obediently drew. To say I was excited in the depth of my being in kind of an understatement. I truly felt the Lord was highlighting this tree to me. I called mom and told her about this experience. I passionately described the tree to mom telling her that the branches were bare but there were these exotic buds and flowers all over the branches. I told mom that the flowers were so exotic that they didn’t look to me like they would be on a tree but on some exotic plant. Mom immediately said to me ” Cindy, I believe you are talking about an almond tree. When you get home get on the internet and look up the almond tree.” And that is exactly what I did. As soon as I arrived home I went directly to my computer and looked up Almond tree. The first thing I found was this Vincent Van Gogh painting you see below. Looks very similar to the picture Hannah drew doesn’t it! Wow!!! I was so very eager to learn what the Lord was showing me by highlighting this Almond Tree to me. The Rod of Aaron was an almond branch. The prophet Jeremiah is asked, what do you see? He answers the “shak-hed” tree. The Hebrew word shak-hed means to be wakeful or to hasten. The Almond tree occupied an important role in ancient world and indeed a prominent place in the Bible. It gets quite a few mentions in the Bible and this is largely to do with the fact the Israelites adored the tree and the fruit it produced. 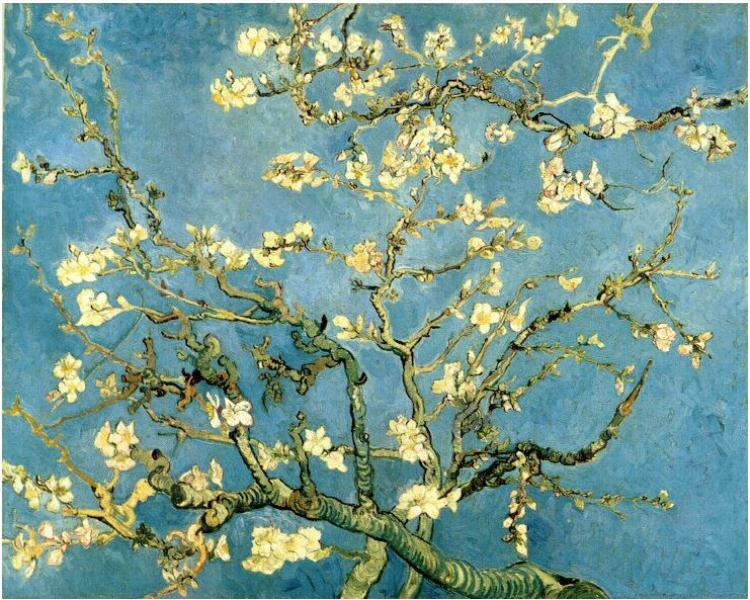 Almond trees were a source of beauty, inspiration, food, and medicine. Israel is a hot, dry, unforgiving desert in many regards. The almond tree digs its roots in between hot rock and anything else it must pass to find water and nutrients. It survives the lack of rain, the heat, which could kill an American rattler snake, the frost, and the wind. It more than survives, it produces the most incredibly beautiful flowers at the first sign of spring, and delicious, nutritious fruits follow. The Israelites were so impressed with its power to thrive under harsh circumstances it became as a symbol of a desirable human traits. The ancient Israelites likened someone who could turn a horrible situation into a positive situation to an almond tree. Gerard was referring to almond milk, a very ancient beverage used since well before the biblical days to help the body repair itself. The almonds were soaked and grated, and the puree was added to boiling water. This water was then sweetened with honey; the resulting almond “milk” was one of the staples of the sick room. People drank this milk to speed the recovery process and insure a return to strong vibrant health. Christopher Hansard, a Tibetan Bon Medical Doctor, told me the following about almond use in Tibet, ” The almond is seen as a hot food that will drive out recurrent illness and diseases carried by the blood. It is also used to cure mental fatigue due to chronic illness and for fatigue in general.” Dr.Hansard feels that almonds drive disease out of the body the way a blow dryer drives water out of your hair. He said this of the tree itself, “ People living around the Holy Land still use the almond as a medicinal substance. Wow! Once again I am in awe of the Lord confirming to me healing! My sheep hear My voice and I hear theirs. Not only do I hear you, I know what you are thinking, feeling and every need you will ever have in your life. I am omnipresent. My beloved daughter, when you initially heard this diagnosis, I heard the cries from the depths of your heart. I saw you mourning deep in a pit at the potential loss of your health. Feeling as how would you possibly climb out of this circumstance. This wasn’t your first time battling for your health. The enemy has fought you in this area of your life before. My sweet, sweet daughter, I am going to keep on telling you…The enemy is a liar! I saw your reaction to the way you felt as the walls surrounding were closing in on you. The walls felt slippery and slimy to your touch. I heard the thoughts running through your mind, thinking analytically how in the world would you even start trying to climb out of this deep dark slimy pit. I also saw the way you trembled in fear as the doctor was giving you a picture of what was to come. You were trying so hard to be brave and believe in Me and what My word says about your but for a moment it was difficult for you. To see you transform not from logic or a different report from the doctor. It was simply a word from Me that touched and healed your heart from fear to faith. It was magnificent this moment when you transitioned from just one word from Me! It was like a metamorphisis from caterpillar to the lovely butterfly. You are free My beloved. As I watch you now singing, praising and dancing before Me with thanksgiving what a delight! Literally telling the world what I alone have done for you, it is a outstanding testimony to Me! I have lifted you out of the pit the enemy tried so hard to keep you in. I work everything for good in your life even at times when things look unattainable. Even though you still haven’t actually seen the manifestation yet. As there have not been any new developments with your doctor or specialist and your treatment is still scheduled for January. I want you to know that I am rejoicing with you that you are irrevocably healed and set free! Beloved, hear Me! I chose you! Although this shouldn’t be a revelation to you, believe Me and keep this close to your heart. As you have thirsted after Me, I am not only showering blessing upon you, I am saturating you with My blessing and provision in many different forms. At times you have to look for a blessing I have provided as it’s not as obvious as others. I can assure you though as you look closely, you will start to see overflowing blessing for not only you but your future generations to come. I am calling out of you gifts and talents I have poured into you. It’s time my precious one to boldly start stepping out in faith to accomplish the work I have set before you. I am laying the foundation of your divine purpose here on earth. I have a phenomenal future planned for you. You are required to take action to start taking one step in the direction that I have set before you. Speak declarations in My name of anything you want to see accomplished in your life. You are going to be blown completely away with the activation of things to come by speaking, declaring, and using your authority in My name. I am going to shake up your world in the most exquisite of ways you can ever imagine. Things will begin subtly and then start to excel. It is of My good pleasure to show you great, marvelous and mighty things that are coming My beautiful, lovely beloved daughter. Jacob, My servant; Israel, My chosen. and let My blessing flow to your descendants. like the willow trees lining a riverbank. Yet others will write “Property of the Eternal” on their hands. Eternal One: I am the Eternal, Creator of all there is and will be. I alone stretched out the heavens and spread out the blueearth. and I make the fortune-tellers look like fools. and I show the fault of their reasoning. and I accomplish what they predict. I confirm their predictions. They will rise from their ruins. and your rivers run dry. At our church Habitation service on July 21, 2013 the teaching was on healing. Pastor Steve Dulin talked about what healing is and lies the enemy tries to make us believe to hinder us to receive restoration from our Lord. How many of us can relate to this? I can totally relate! For me, it was just last month at our last Habitation service. The enemy tried to distort what the Lord was showing me in a vision. This is why it is so important to keep our focus on the Lord and believe His truth. We usually arrive early to the pre-service prayer to get a seat close to the front of the sanctuary. We arrived late and all the seats close to the front were taken. I do believe God has a plan for everything even our being late. Sitting in the upper level I was able to get a different perspective of all the people gathered. It was as if the Lord was showing me a birds eye view of all the people filling up the sanctuary to the point of overflow ready for God’s healing touch. Wow! It is so wonderful to see so many people on fire for God. By taking action themselves just to be at this meeting to believe and receive healing from the Lord. Amazing testimonies were presented. What a faith builder to see and hear ordinary people getting healed supernaturally from God! There is no other way to explain the healing that is taking place other than God Himself is healing. God is no respecter of persons! If God is no respecter of persons and He is, then what He does for one He will do for all. That is a promise from the Lord. The Elders of our church started to give words of knowledge. I asked the Lord, “can I have another confirmation of my healing”? Just then Pastor Thomas Miller said a word of knowledge from the Lord that He is healing the very thing I’m believing for. How incredible I received another confirmation of my healing! I am so excited in my spirit! I am in awe of God! To see before my very eyes the Lord’s magnificent power at work. I continue to think about the first fruits prayer I prayed at the beginning of the year. I believe the Lord is answering my requests, bringing me to a place of overflowing health and wholeness like I have never known before. It says in John 15:16 “You did not choose Me. I chose you, and I orchestrated all of this so that you would be sent out and bear great and perpetual fruit. As you do this, anything you ask the Father in My name will be done.” By Jesus stripes I am healed! I am seeking the Lord in every area of my life. I want to live a Kingdom life. What I mean by this is I want to live in the role that I have been given by God. The role as the daughter of our most high King. This means I am a princess and an heir to the throne of God. To wrap our minds around this principle we can all live an abundant life of fullness. keep my instructions dear to your heart. a long, healthy, prosperous life. meditate on them so they are written upon your heart. and they will think well of you. never depend upon your own ideas and inventions. and He will smooth out and straighten the road that lies ahead. 7 And don’t think you can decide on your own what is right and what is wrong. Respect the Eternal; turn and run from evil. and will be strengthened at their core. 9 Pay tribute to the Eternal in all of your affairs. Honor Him with the best of what you make. and have plenty of food to eat and wine to drink. On June 16th I shared my testimony with you all. On June 28th a sister in Christ came up to me, very excitedly told me the Lord showed her my healing. I asked her to write out what the Lord had shared. This is what she wrote…” The Father, last evening, told me that you have something very special done by Him for you. I asked Him what I could do to repay your love to Him that has been manifested in your friendship with me. He showed me your healing. In your body’s core area are a (liver, spleen area) there is a healing. It is horizontal (perpendicular) to your head but is located waist high approximately. The healing wheel rotates and radiates heat, it puts off healing sparks. Your spleen and liver are healed by our Father. The sparks of healing continue to radiate down to your feet, through your hips and legs and all your pelvic area, lower back, are healed through His warmth. The sparks also are shooting upward, and the last healing will be your headaches. You must not worry anymore. June 28,2013.” Exodus 14:14 NKJV – The Lord will fight for you; you only have to be still. After I received this word, many emotions flooded my mind including elation, relief, joy, excitement and liveliness. Yes! What God was showing me was being confirmed by His word. How interesting to me, the word liveliness has the word live in it. The Lord has shown me in Psalm 118:17 NKJV – I shall not die, but live, And declare the works of the Lord. Wow! If we will focus, on what the word says we are, what a difference it can make in our lives. In Isaiah 53:5 “But He was wounded for our transgressions, He was bruised for our iniquities; The chastisement for our peace was upon Him, And by His stripes we are healed.” This verse rocked me to my core. The witness kept going and going all over mom. It was on her head, down her body, even her toes were tingling. Mom continued, “Do not back off from your healing, no matter what any body says, no matter if you feel any lying symptoms, or if you receive any report contrary to this word.” Wow! This is called Faith! When my sister gave me this word, she didn’t know any information, concerning my diagnosis. The only thing she knew is I was desperately seeking healing. The only way she could have known anything was by the Lord giving her a word of knowledge. In my initial diagnosis, only one of the organs needed healing. I didn’t even have the whole medical picture yet. I sensed in my spirit after reading this word, there was more to the story since the Lord showed my healing had taken place. A few weeks passed by, I still hadn’t heard anything from the doctor’s office pertaining to the two tests. The enemy was playing with me, whispering lies into my mind. I kept rebuking, renewing my mind daily, believing what the Lord says about me. I am healed. I was healed! I slowly dialed the number, and when they picked up, I gave my name and stated that I’m waiting on results for two tests. My heart was racing a bit but suddenly I felt relief: a calm and a peace. I sensed the Lord was right there, in that little room with me. Thank you Lord, for your comfort during this time. The nurse stated right off there was no cancer! My organs looked good, yet my spleen and liver were slightly enlarged. (I didn’t know about my spleen, but I wasn’t surprised, the Lord had already spoke the word to me, I am healed, it just hasn’t manifested just yet.) The nurse was kind, reassuring me the reports looked good overall. She explained that the doctor wished to place on a waiting list to start treatment in January. I am open, to whatever the Lord’s plan is for my healing because I know that I know that I know I am healed! I rejoice because the Lord is bringing me to a place of wholeness, that I myself asked Him for this year! Thank you Lord for knowing what is better for me than I know myself. I appreciate that God has put me in a place, where the doctor can help in my healing process. At the end of the conversation, the nurse told me she would mail me the results of the tests performed. When I received the report, I was in awe of God once again. It showed something so minimal in my pelvic area the nurse didn’t even feel led to discuss with me. The Lord showed me so clearly the verse in the bible… the truth that He knows every hair on my head, and every cell in my body. I completely trust that it is by His son’s stripes I am healed. Amen! Eternal One: Remember who created you, O Jacob? Who shaped you, O Israel? See, you have nothing to fear. I, who made you, will take you back. keep going; you won’t be burned. Egypt, Cush, and Seba, in exchange for your freedom. On March 17th at the Habitation service, only 3 days after my diagnosis, our Pastor Steve Dulin had a word of knowledge from our Lord, Pastor Dulin called out the very organ of which, by Jesus stripes I am healed! The Lord showed him people being healed of various things that evening. I claimed my healing in Jesus precious name at that moment. I believe on March 17th I was healed! Only a few months later God would show Himself so beautifully again, during our June Habitation service the Lord showed me a vision. The Lord showed me a bunch of branches, then He showed me people among the branches. I was so very excited to see a vision from the Lord. This was during the pre-service prayer time in the worship section of this service. Then we all took a break in between this pre-service prayer and the Habitation service. During the break, I felt a bit of fear, like the enemy was whispering in my ear, “what do you think about the Lord letting you see a vision of bare branches?” When I felt this fear, I suddenly felt the Lord’s presence, He assured me that He would not give me a vision that would evoke fear. This was clearly a distraction from the enemy to get my focus on fear and not on what the Lord was doing. We all started worshiping again, I was having a God encounter, I felt the Lord in the depth of my spirit. I was so on fire for God, that I was to the point that I was actually jumping up and down praising God during the worship section. For anyone who knows me, I don’t jump up and down. Not because I don’t want to, it’s just I haven’t been able to. Well, let me tell you, in this service I was able! Then, I heard the Lord say clearly, look up my child, in obedience to the Lord, I looked up to see the very branches the Lord showed me in this vision, only it was shadows in the shape of branches, on the platform, where our worship team was standing. Wow! The branches, with the people on the branches. I felt this excitement, I was very thankful in my spirit, as the Lord showed me physically, what I was seeing in this vision. Back into worship I went, I heard the Lord softly say spring, I sensed a feeling of something new, spring, I started to see the branches again only this time I saw buds and flowers appearing in different areas of these branches. When the speaker started to speak that night, the first point was *remind yourself of His character – I was quickly reminded at that moment, the Lord’s character is of love and honor and certainly would never give me a spirit of fear. The second point was * embrace the process – The Lord was clearly showing me, there is a process in healing. This vision is a process, things in our lives are a process. I sensed the Lord showing me breakthrough! There was a process in the breakthrough that I am so desperately seeking. The third point was * we need to remember we are not alone – I am not alone! At different seasons of my life I may have felt alone. I am now a part of God’s Royal Family! Back into worship we went, I heard the Lord say to me, “beloved daughter, do not be ashamed, not even for a moment, as at that precise moment you gave your life to Me, all the shame vanished instantly, now you are white as snow to me!” The minute I looked up, a purple light from the platform shown directly on me! It was amazing to me, I felt the warmth and comfort of My Heavenly Father shinning His Sovereign light on my face, as it penetrated to the very core of my mind, my very being. Just yesterday, the Lord showed me what it’s like to be a part of His Royal Family and even gave me a teach on Strength. I felt the Lord was shinning His glory directly on me, His royal purple light on me. Goodbye shame, embrace my place, stand in my place/in my role in His Royal Family, the family of God. On my way home from this Habitation service, my daughter Heather was driving, I was in the passenger seat, my daughter Nicole along with my friend Tracey was in the back seat of our car. All of the sudden I felt as though I had heated seats in my car, like a heating pad was on my back radiating heat throughout my body. I got so excited as I know that when you feel heat in your body, this can mean healing! I believe the Lord healed me at that moment. This heat felt so good on my back, I didn’t want to leave the seat, I felt the Lord’s touch, it was the most amazing feeling I have ever felt. I didn’t want this feeling to stop. No one else in the car felt this heat. I even had everyone in the car feel my back to be sure I wasn’t just feeling things. I wasn’t, there was absolutely heat distributing through my body. Thank you Jesus! Praise you Lord! God has a purpose for everything beloved. Be encouraged! Then you will know the Lord of hosts has sent Me to you.